Stuff your elf firmly. Sew the soles onto your feet. Embroider red dots and a green stripe onto your hat. With yellow yarn sew on strands of hair. Stuff your hat and sew it onto your elf's head. 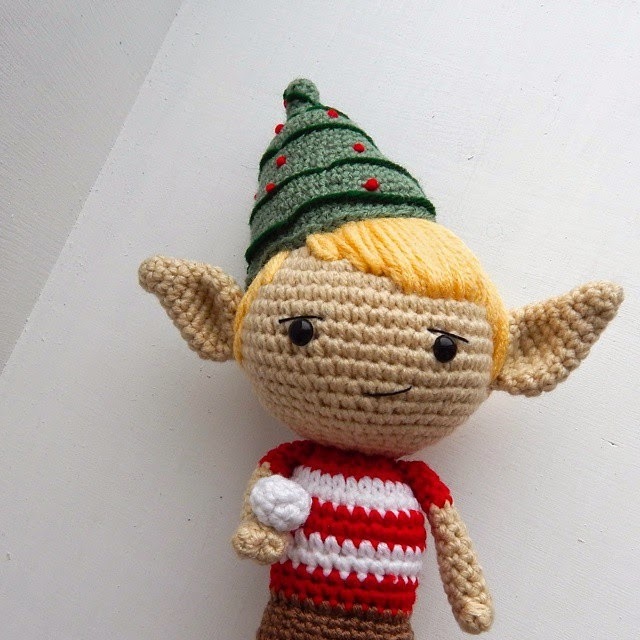 Stuff the arms and sew them onto your elf. Sew the ears onto your elf. Sew on eyebrows above the eyes, and sew on a mouth. Hi, how are you? I am Esther, I have one blog, Awesome needles, and I translate free patterns to Spanish. I want to translate this pattern in my blog, it is possible? Than you very much. Can you help me clearly? i cant understand. Thank you so much. Thank you so much for your clearly explain , i will try and try again and i hope i can show you my elf . This elf is so cute!! I made it, and it gives me 36.
i don't know if i'm making a mistake. This is really lovely but looks hard for me - I have only made a couple of amigurumi so far. Do you think it would work out with a slightly bigger hook, say a 3mm? Thanks for sharing your patterns you are very talented!